What’s the first you think about when you see a spider? Running away? Danger? Fairies? Spiderman? Do you wonder if spider silk is really strong enough to stop a train, like they showed in Spiderman 2? Whatever your thoughts, you’re probably not thinking about 3D printing in space. Yet, the time might be near when astronauts will be using 3D printers filled with spider silk to make replacement parts in space. I learned about this idea in a presentation from Dr. Ron Sims, Utah State University, at the Bioman conference at Salt Lake Community College a couple of weeks ago. Spider silk, as I learned is amazing stuff. 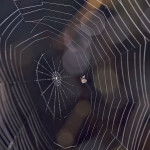 Multiple kinds of proteins are used in spider silk, and there are multiple kinds of silk. 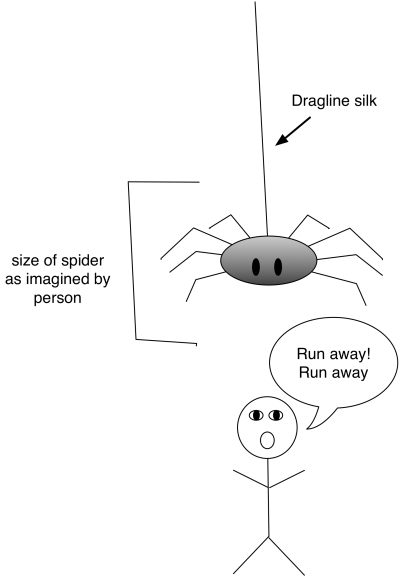 One of the strongest is the dragline silk that spiders use when they drop down from the ceiling and frighten members of my household. One of the most amazing things, to me at least, is how spider silk changes from a liquid form, inside the spider, to a solid, strong material that we see in their webs and other constructions. Hagn et. al. looked at part of the Dragline silk protein Adf-3 to try and understand the factors controlling this transition (1). We can see the same things these researchers did by downloading the structure and viewing the structure, either from the NCBI, or PDB, and exploring its features. To follow along, you'll need a copy of either Molecule World or Cn3D. You can get Cn3D from the NCBI. Visit the iTunes app store to download the Molecule World app and explore these structures on your phone or iPad. 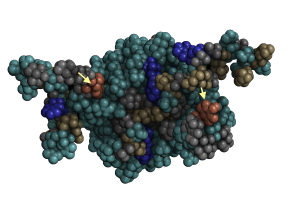 Then, download the dragline silk protein structure. 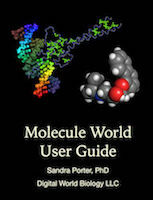 If you have a copy of Molecule World, you can just click the “View Structure” link on the structure record and choose to open it in Molecule World. Or you can search for it in Molecule World with the PDB ID, 2KHM, and download it directly in the app. This structure only contains the carboxyl end of the protein but it's enough to tell us something about how it works. After you open up the structure, change the coloring mode to molecule to see how many protein chains are in the structure and how they're arranged. 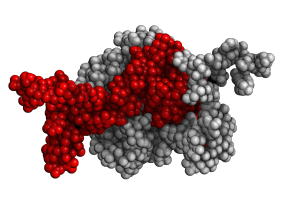 The red object is one protein chain and the white object is another. If you turn the structure around, you see there are two chains wrapped around one another. There's kind a glob part in the middle and two sticks on either end. It almost looks a little like a spider when we turn it around. Now, change the coloring style back to element. The yellow atoms that form the disulfide bond are both sulfur( Di = two). 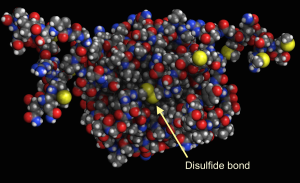 Disulfide bonds make proteins stronger. The disulfide bond, in the middle, between the two chains, helps hold the two chains together. If we change the coloring style to charge, we can see another interesting feature. It seems the residues in this protein are mostly grey (neutral), but there are a couple of cases where a blue residues (positive charge) and a red residue (negative charge) are next to each other. The interactions between these kinds of residues (positive and negative) are called "salt bridges." 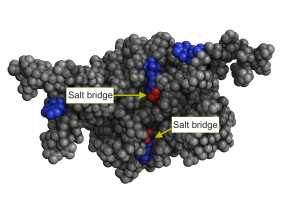 Just like the disulfide bonds, salt bridges also help to hold the two chains together. It turns out, as we can learn from the paper, that holding the protein in a compact shape like this, helps keep spider silk in a soluble form. If we color by hydrophobicity, we can see that most of the amino acids on the outside of the protein are polar. This property allows these amino acids to form hydrogen bonds with water. Hydrophobic patches. Most of the residues on the outside are polar (blue or aqua). 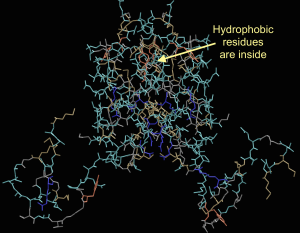 Hydrophobic residues inside the protein. If the ability to form salt bridges is disrupted by shear force, like a printer, or some other means, then, the cysteines are available for bonding, hydrophobic patches become exposed, and the proteins come of out solution and arrange as fibers – i.e. really strong spider silk. Note: All the protein images were captured from Molecule World™. In case you're wondering, the answer is "yes!" Spiderman could indeed stop a train with enough strands of silk (2). 1. Hagn, F., Eisoldt, L, Hardy, J., Vendrely, C., Coles, M., Scheibel, T., and Kessler, H., 2010. A conserved spider silk domain acts as a molecularswitch that controls fibre assembly.Nature. 2010 May 13;465(7295):239-42. doi: 10.1038/nature08936. 2. Bryan, M., Forster, J., and Stone, A. 2012. Doing whatever a spider can. Journal of Physics Special Topics.